Cardiff City owner Vincent Tan and American basketball great Magic Johnson are among a group of investors that has been awarded new Major League Soccer franchise Los Angeles Football Club. The investment group also includes QPR co-owner Ruben Gnanalingam and former US women's football star Mia Hamm. The new team will enter MLS in 2017 alongside an expansion team in Atlanta. The LA club's managing partner Henry Nguyen said: "We believe this team can become a globally-recognised brand." Earlier on Thursday Tan, who also owns FK Sarajevo in Bosnia, told BBC Business he was going to be "minority partner" in the new franchise. "That's my personal, private investment," he said. "I believe the MLS will be a good investment." Tan, who also revealed he is seeking to invest in another unnamed European club, said he remains committed to Cardiff, who he bought in May 2010, despite their relegation from the Premier League last season. 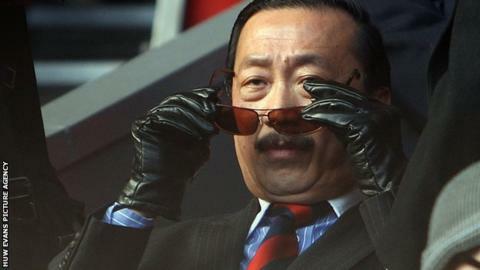 Tan said: "I enjoy investing in a football club and I believe that you can make money in a football club. "I didn't really start off well investing in football, I wasn't that lucky. "But there are a lot of clever owners who make money every year so I now understand the business so much better. "I joked that I invested so much money in Cardiff and it is my tuition fees to learn the football business." On Monday, Major League Soccer announced Chivas USA, which struggled for a decade to gain a foothold in Los Angeles, were folding. The brand identity of the new LAFC, along with coaching staff, will be announced at a later date, according to the MLS website. With a strong soccer fanbase, Los Angeles also is home to the four-time MLS Cup champions LA Galaxy - one of the original members of the league and the club at which David Beckham made 98 appearances between 2007 and 2012. With the addition of the new Los Angeles club, MLS will become a 22-team league in 2017 as the new expansion team in Atlanta will also begin play that year. Two more expansion teams will be added by 2020.